Welcome to session 2 of Power of Properties. 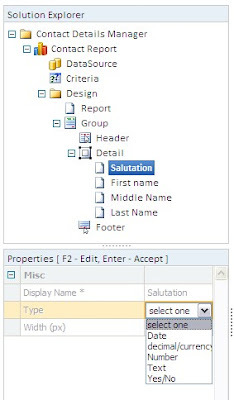 Today we will learn about the properties which we can set and use for reports in our application. Reports are very useful in representing the data in simple formats. The purpose of a report is to show information, collected after performing operations on the data, to the user about certain topics. 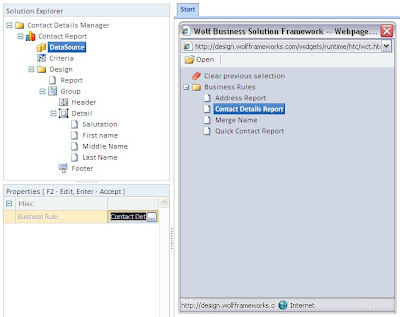 Report building is so easy to implement in any application built on Wolf Platform. One can easily set properties to get customized and easy to understand reports for his/her application. To begin with, we can give a name to our report, which is mandatory for any report. 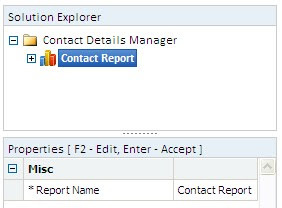 The asterisk symbol over the property Report Name describes that this is a mandatory field as shown in figure 2.1. We access data from a data source and generate report for that data. 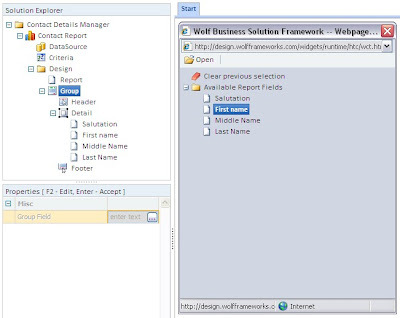 We can select the Data Source for report by selecting business rule, which we have already built, that act as the data source in Wolf Platform. So the property which we can set for 'Data Source' element is the 'Business Rule'. We normally group our report by a particular column or field to get not just a report but an organised report. Wolf provides this feature too for reports. Just one need to go to the 'Group' element and set the property of 'Group Field'. Group Field: The output is expected to be ordered by this field. For example, in figure 2.3, the output for generated report will be ordered by the 'First name' field. Reports have columns which take data from the fields in the search screen in Wolf Application. So it is required to find which fields should be used in report according to the requirements. The fields identified and used need to have some properties set for better presentation in the report. Display Name: It is a mandatory property for the fields present in Detail Section of Design element of the report. The name given here will be displayed as the column header for this particular field. Type: There is different pre-display formatting that happens for different types. The formats already provided are Date, decimal/currency, Number, text and Yes/No, as shown in figure 2.4. We can use these types for any field acting as column in the report. Leave this blank if you are expecting the business rule to return this as an alphanumeric value. Width (px): This property specify horizontal width in pixels for the column in your report. You can change the width of any column to make them look more presentable in your report. In this session, we learnt how to use properties to make our reports look more presentable. So I hope this will help you extract more functionalities from the available Platform. Meet you again on another exciting session of PoP.